Tammerie and Mary | "Have two people ever worked so hard to achieve the ordinary?" "Have two people ever worked so hard to achieve the ordinary?" Well. For a hopeful romantic, there’s a lot to get carried away about. What to give your beloved, that’s made of paper and means forever? 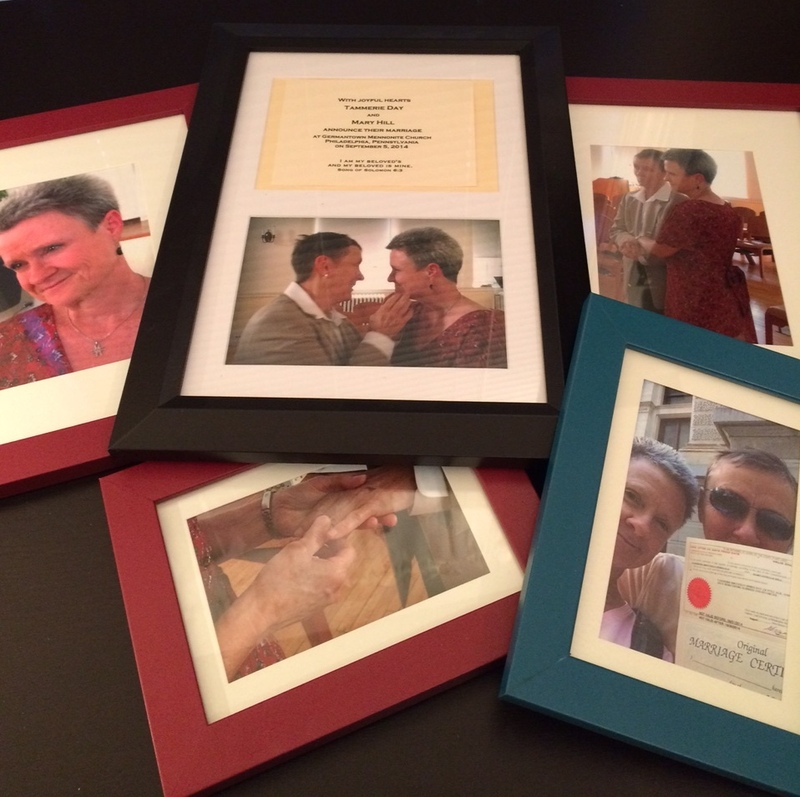 How about printing and framing your wedding pictures? In this case, procrastination made for a serious win. Of course, there’s more. For gay people still pinching themselves over being able to get married, a piece of paper is a big deal. 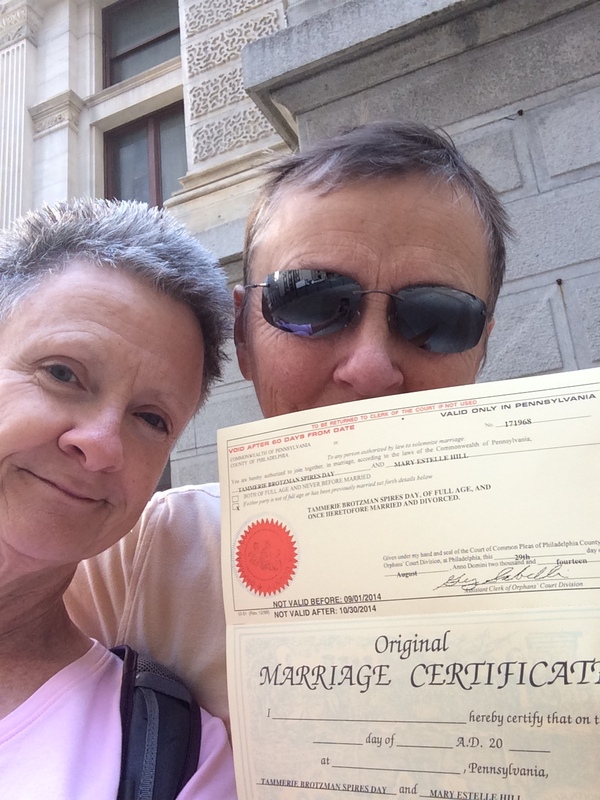 One of my beloved Mary’s favorite pictures is the snapshot we took in front of the Philly courthouse, holding our freshly minted marriage license. On the day we married, we were among thousands of couples who were married in one state and in limbo as soon as we crossed the state line. That changed for all of us when the Supreme Court recognized the promises we made. Mary: It still doesn’t seem real sometimes. I still pause, hesitate a bit when I tell others we are married…or “this is my spouse”. Married. For the rest of my life, I am married to someone whose eyes can make me cry, whose voice on the line gets me through long lonely nights without her. Some people take this marriage thing for granted. Not me. Never. A year has gone by…..everyday ordinary living…..and my ring is little more worn smooth. We grow older, we grow wiser, we grow together, our lives entangled like the pretty vines Tammerie has planted outside on the deck. I am the luckiest woman in the universe. I love you, Cootie. This entry was posted in Uncategorized on September 6, 2015 by tam121. Mary writes: Does it feel different? I don’t know exactly. Well, I am married two days now. TWO days. Changed the marital status on my employer’s web site, changed my profile with my bank, and changed my status on Facebook. So, it has been that kind of Sunday when the air is cooler, a hint of fall is in the air … and I am married. We took some cheese and sneaky wine to the park, watched dogs and kids, and talked about our future. Cootie looks luminous. This beautiful kind rabble-rousing woman is married to me. Married … I can’t stop saying the word. Married. So, yeah, some things have not changed at all. We “married” one another sitting on a log by the creek at our house in NC … years ago. 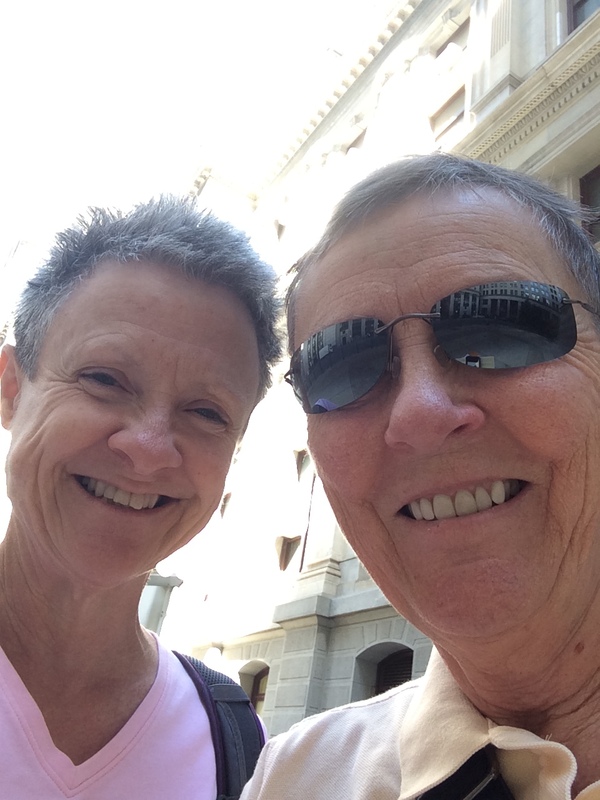 We “married” over and over, every time we had to hassle about the kiddos, or deal with the death of her parents, or struggle with her vocational longings, or confront the passing of years across my face. We’ve been “married” all this time if you want to define it as love plus commitment equals forever. Now, the quotation marks are gone. We are simply … married. And, I cannot look at the ring on my left hand without feeling the tears. This entry was posted in Uncategorized on September 8, 2014 by tam121. “How does it feel to be married?” our friend Calenthia asked us moments after the ceremony. I did not have a good answer, having just stepped off the emotional equivalent of the Six Flags Giant roller-coaster: laughter, tears, heart exploding, body zinging. One feeling that has arisen over and over is gratitude for the work and witness of Germantown Mennonite Church and its pastor, Amy Yoder McGloughlin. Excommunicated by Mennonite institutions because of their welcoming of gay people, as I would have been had I stayed in the Mennonite church upon discerning my own gayness, they have created a welcome in the wilderness out of slim resources and deep hearts. And here’s another answer, the feeling that began to bubble up in the car ride back to the Bunkhouse: being married feels like a strong foundation. It feels like solid ground under our feet. It feels like our roots can deepen and entwine, there to be held and supported by that good ground. This entry was posted in Uncategorized on September 6, 2014 by tam121. M and I awaken in the Philly apartment we affectionately call The Bunkhouse. She brings me a cup of coffee. “Will you marry me today?” Yes, I say, kissing her sweet face. Yes, an infinity times over, yes. We walk through the day, an ordinary day in which nothing will change and everything will change. It strikes me how like grief this is. When someone you love dies, the hollow place persists for so long, colors are grayed out, you can’t understand why everyone is just going on with everything: laughter, boredom, complaining, routines. This joy, in a similar way, suffuses everything and yet not everyone – people around us are just going on with everything: frustrations, distractions, hurrying, ignoring. As with the grief, so with the joy – for the most part, we let the world swirl by. We offer our true faces and feelings to a few companions, and do our best to be in the moments as they unfold. Walking toward our wedding hour, I hold my loves – M, Harper, Chandler, our beloved friends – in my heart, trembling full and sparkling like a bubbling glass of joy. This entry was posted in Uncategorized on September 5, 2014 by tam121. It’s a calm and quiet day. M is at work; I am in the Philly apartment tailoring a simple order of service for our marriage. Next year there will be a wedding celebration in North Carolina for our family and friends; this one is just for us, and the law. But, as always, we find the silver lining in the hoops we jump through. There is an ease in this simplicity and smallness. It lets us focus on what is happening rather than hoopla. Pastor Amy will welcome and pray for us. We will read Psalm 139 together, reminding us once more of that day in Duke Chapel. After M’s oblique proposal, we had wandered the ornate building, ending up in the basement among statues and headstones, carvings and bays. Finding a large Bible on a lectern, I waved M over to join me, turned to my favorite text and began to read. Somewhere along Sheol, she turns away, and I think I have offended her, pause for a moment. She turns back, her lips set, and nods at me to continue. When I finish, she turns again and this time walks away. I follow her. We are silent, walking through and back up into the sanctuary. We sit in a pew about halfway back, quiet, breathing together. She begins to try to explain what happened, earlier, when we stood before that Bible. How something inside unfolded, at the thought of an every-when, ever-present God who has somehow ordained our presence in this time and place. As she gives up trying to find the words, I say the ones at the top of my mind. “How are we going to do this?” I am aware of the children back in Texas, the not-yet-complete Ph.D., the aging parents. We stand and walk back down the aisle, out the enormous doors, into bright sunlight. Standing on the steps, blinking, words pop into my head. I feel as if I have been given the gift of a promise, a gift to share. I turn to M, and say the words. “Way will open.” We walk on into the surprising and yet ordinary day, just a day, but one that it feels our lives are pivoting around. The part of the service where we will say our vows is blank. M is deciding what she will say. I am unable to decide. Words are so inadequate. I have been living my vows with her for years already. I have moved. I have not moved. I have brought my children into our relationship; sometimes I have kept my children out of our relationship. I have introduced her to my parents; we have buried my parents. I have left her in order to work; I have turned down work in order to stay with her. I have held my own in our disagreements; I have held on to us in the foundational agreements that structure our life. I have created and held a safe harbor for her in my heart, believing that – odd as it sometimes seems – God has entrusted her to me for safekeeping. God willing, I will care for her until one of us breathes her last. My cell phone rings. It is the hospital where I have interviewed for a job. They say they want to offer me the job. Joy erupts within joy, because a way has just opened that we have worked and prayed for for years. I will be able to keep my promises. I hold this joy inside until M and I meet for lunch, where I surreptitiously order two glasses of champagne. I sit down with her, and we begin to chat about the morning. The two sparkling glasses arrive, and she looks up at me. “I changed your drink order, because we have to celebrate. I got the job!” Her face crinkles into laughter and tears all at once, and then we are both laughing. How are we going to hold all this joy? It just sizzles over into everything. My beloved M is back in Philly. We set about the task of finding someone to marry us; she takes the civil route, and I take the church route. While she is contacting judges’ offices and finding booked calendars, I call the first pastor on my list: Amy Yoder McLoughlin of Germantown Mennonite Church. There’s a little bit of backstory here. I was in the Mennonite Church for about a decade; it’s where I came back to church after 20 years away, and was eventually licensed and ordained to ministry. All that came to a screeching halt when I figured out I was gay and an overly zealous conference minister tried to make that a cause for investigation. I left the Mennonite Church, although nothing could lift the Anabaptist imprint. So, sometimes justice is a poet, and in this case, she is weaving a lovely irony into the loveliest of days, because Germantown Mennonite and its pastor also are renegades, kicked out of the Mennonite Church for accepting LGBT folk into membership and even – gasp! – ordaining a gay man. So, the renegade Anabaptist calls up the renegade Anabaptist pastor of the renegade Anabaptist church and Pastor Amy says yes, she’d love to marry us. And the date is set: September 5, 2014. At ten in the morning, we were sitting in school desk style chairs in City Hall, in a drab room that looked like a DMV. It was the Court of Common Pleas, the place to get a marriage license. We were waiting our turn. I had $80 in my pocket, in sweaty crumpled bills. Cootie had an envelope with papers we needed. There was a male clerk sitting in a cubicle with a computer. The cubicle wall poster said “Fly, Phillies, Fly.” It all struck me as so very ordinary. This is what people do when they want to get married. They go to the Court House, fill out papers, pay fees and, voila, they get a Marriage Certificate. It’s not called a license in Pennsylvania. Then it happened. The clerk stood up and said, “next couple,” and that was us. The first miracle. I tried. I really did try to keep from crying. We were asked questions. Do you have communicable diseases? No. What is your mother’s maiden name? What is your cell phone number? Jesus, Mary and Joseph, I don’t know!!!! The clerk said the form had not yet been updated, so it still had bride and groom on it. Pictures of our IDs, checking to see the clerk had it all down right … I thought about whether I had put on deodorant that morning. I asked the clerk how many of these forms he did per day. ”Oh, ten or fifteen,” he replied. No big deal. Right. Cootie looked calm. We were not dressed up, knowing that a long road trip to NC lay ahead that day. Cootie’s face betrayed her though. I know she is a storm of emotion when that vein in her temple starts twitching. She grins and laughs a nervous laugh. My beloved. Then, the second miracle happened. The clerk returned and in his hands, held up before us, was a large official-looking paper that said “Marriage Certificate.” Instructions for completion included. Cootie touched my hand. The clerk mumbled something about a waiting period, where to return the forms when our marriage ceremony is performed. We’ve got sixty days or the whole process has to start over. Reminded me, at that very moment, of how I always warned the kiddos they had to get their cars inspected within a certain time period. I’m losing it about here…..I am, I am LOS-ING IT. As we rose to leave, the third miracle happened. My back was turned and I was rushing to get out of the room, knowing the tears were building up like steam in a pressure cooker. Behind me I heard the clerk say “congratulations.” A perfect stranger, a guy in a plain white shirt, a government employee, a Phillies fan…said congratulations to US. Perhaps he says it to all the “next couples.” I don’t know. But, I heard him say it to US. The third miracle. 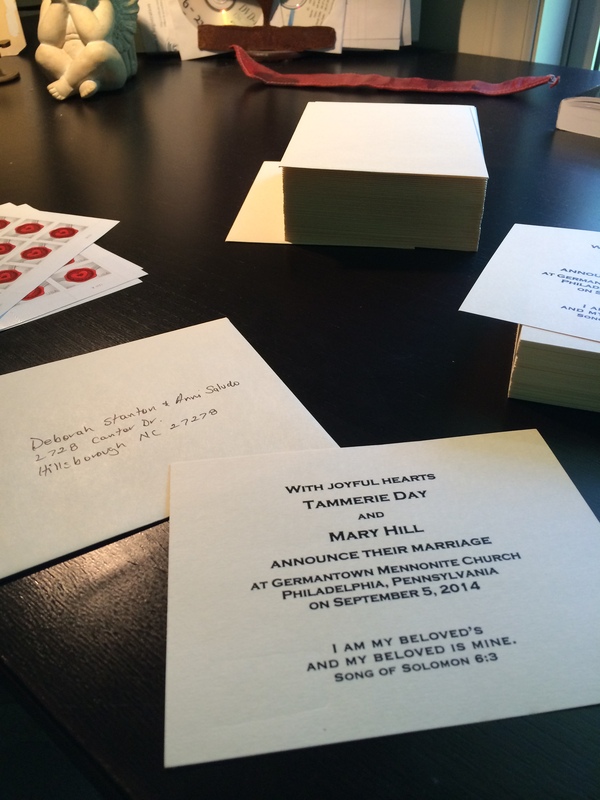 Three miracles that day: the next couple, the Marriage Certificate and congratulations from a clerk. In City Hall, in the exact center of William Penn’s 1682 city plan for Philadelphia, on a warm August day, Tammerie Day and Mary Hill got their certificate to be married, legally, and the world just kept right on turning. I am 71 years old and I am getting married. We have laughed and cried a lot this past weekend. The reality of what we are about to do has begun to sink in deeper. There have been hard conversations about revisions of wills, the kids…… those dreaded “what if you/I die first” talks. I hate it. Being 20 years older, the odds are very good Cootie will be left behind. Enough. I can’t write about this. Ehhh, not bad but not great either. I don’t really know what to say and I am certain it doesn’t matter….because I will spend the entire time crying my eyes out. Cootie says bring a towel…Kleenex won’t be adequate. We went to the Mennonite Church to see it and to meet the pastor who will marry us tomorrow at 5PM. Cootie will probably say more about all that than I will. Tonight I am quietly mumbling my vows under my breath, trying to practice. And wondering how it will feel to be married? The clothes are all clean and pressed. It felt weird today, telling a couple of people at work that I am getting married tomorrow. Almost like, in an odd way, that I was not entitled to use those big people, adult words … still. Like I was pretending somehow. The suit just does not fit … yet … but it will. Aunt Grace, I am 71 years old and getting married. Do you hear, do you see, do you know? Will you be with me tomorrow? Will you be proud of me? Cootie found out this morning that she got the UNC job! I was dreading another rejection, another hurt look in those beautiful blue eyes. But today, she grinned and her face cracked wide open with such joy! Those UNC people don’t know what they are getting — she will knock them all flat! My wonderful fierce-spirit woman … so very proud of you. So this is our last night of living in sin. God, look down here, look this way, and see us. And wrap your arms tight around my beloved. I’m giving up the single life. I’ve taken care of plans for dinner and occupied myself with work this morning. Now, the clock is ticking and within a few hours, a new life I never thought I would be living, will begin. Lord, thank you, for keeping me alive long enough to see this day. Eight years of life together, punctuated by periodic proposals, acceptances, laughter and tears, legal victories and delays, came down to this: one of the states we domicile in will let us legally marry, and the other will not. Yet. While we wait for our home state of North Carolina to do the right thing, we decide it might be prudent – and altogether wonderful – to get married in Pennsylvania, where my sweetheart works and does her part to make our lives possible. I drive to Philly, with all my papers in hand, and off to the courthouse we go. And what a courthouse … if you are going to a courthouse to get a marriage license, you want it to look like this: a wedding cake of a building, smack dab in the heart of the City of All-Kinds-Of-Love (not just brotherly), and – as my sweetheart noted – the cradle of liberty. A liberty that was becoming a little more ours, citizens that we are. We wander around the building. I am trying to feel all the feelings running around my heart and soul and mind and body: calm, excited, confident, curious, sure of our task, unsure of our process. We go into the maps and information office and my beloved M asks a couple of white-haired volunteers for the ladies’ bathroom and the wedding license office, in that order. They laugh, congratulate us happily, and give us directions. I remember the card I had sent M years ago. I had written inside: “Have two people ever worked so hard just to achieve the ordinary?” And here it was. The ordinary, shot through with amazement and love, like sunlight streaking through the woods. We walk granite-lined halls and foot-worn floors to an echoing bathroom: spotless, sunlit, an odd mix of fixtures and utilities. Our eyes meet in the mirror as we wash hands; she looks like a four-year-old headed to the circus, anxious and happy fighting for control of her face. “We’d like a marriage license,” M says. Her voice is in the upper registers. I look at her; she does not look back. He takes our driver’s licenses, social security card, my divorce decree and name change documents, and walks away. “I can’t believe this is happening.” There is such wonder in M’s voice. I grin. I am wondering, too … if we had everything we needed, or if we’d be thrown out on a technicality. The young man comes back, hands us our papers, along with a dated photocopy of our licenses. “Here you go. Give this to the person that calls you. Please have a seat.” M takes the papers and we sit down. I want to hold her hand, but she has a deathgrip on the papers. She will not meet my eyes. I know she is trying not to cry. A clerk at the other end of the counter had motioned the young man and woman before us up to his section of counter. The urge to duck under cover of cell-phone checking is suddenly almost overwhelming. I sit back, taking in the room, my beloved M, my own feelings. There is more feeling than can fit into these moments. I think back to the first time M had proposed to me. It was our second weekend together; she had traveled to Dallas to see me, and now I was returning the favor, on her home turf in North Carolina. We had been touring Durham and had just stepped inside Duke Chapel. As my eyes adjusted to the dimmer light, I took in stone archways, patches of floor riddled with rainbow light, multicolored arches of stained glass illuminating the narthex, gleaming pipes for the organ. “I’d sure like to walk down that aisle with you someday.” Someday? Weren’t we about to … ooohhh. It took a moment to register. Did she mean what I thought she meant? I turned to look at her face, eyes opaqued by the sunglasses she was still wearing. She did mean it. Our third date, and she had just proposed. My mind returning to the Orphans Court, I think of the kids, wondering what they are doing, what they will think, now that we were moving from “someday” to “today” … or something close to it. The people at the counter were standing up, drawing my eyes and thoughts back to the room. That’s us that’s us that’s us that’s us that’s us that’s us that’s us that’s us! I try to feel every step. Slow the moments down. Look at M’s face. The clerk glances through our paperwork, and turns his computer screen where we could see it. “I just want to let you know that system still says groom and bride, but your marriage certificate won’t.” He asks about our names, our parents’ names, communicable diseases, prior marriages. He types and types, slowly, and I want to wrest the keyboard from his hands. He takes our $80. M’s voice is still climbing the walls. It is sinking in to me that we have gotten this far because it is legal for us to go the rest of the way, and we are going to. We have said the right things, brought the right papers, paid the right money. But it’s not about us doing the right things; it’s about our rights. We could have tried to do all the same things in North Carolina and walked away empty handed. This is just proceeding apace, so normally, so casually, so ordinary an action, that will end up changing … everything? Nothing? How we see the world? How the world sees us? I am very aware of the many people in our nation who have rights that are not respected, who have rights but not justice. This is a small drop in a large ocean of rights that need respecting. In my joy I want not to forget the work we all have left to do. After the clerk has us review his data entry, he stands and says he’ll be right back. I look over at M, and she finally looks at me, and her eyes began to fill up. She turns away again as the clerk comes back, holding out a beige certificate with a red seal on it. “Here’s your wedding certificate!” he s ays, beaming. M’s hands fly up to cover her face. I take the paper from the grinning clerk, trying to listen to his instructions. Valid in three days, good for sixty, signature here, copies there. It’s a blur. Joy obliterates everything. He says “Congratulations!” I shake his hand, thank him, and follow M, who is dashing for the anonymity of the hallway. We drive home to North Carolina, license to thrill tucked safely away. We spend the weekend making up an announcement – date TBD – and a list of people to send it to. How very, very ordinary … it makes us laugh, and cry, and shake our heads in amazement.